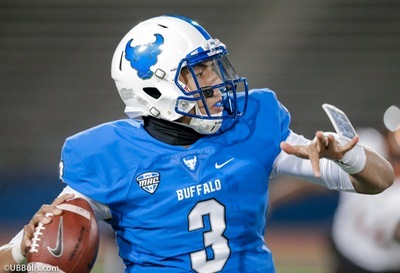 For most of Friday night at Ford Field in Detroit it looked as if the UB Bulls were going to be the 2018 MAC Champion and they were going to be on their way to a nice Bowl Game. Unfortunately, for the Bulls, the wheels came off in the fourth quarter and the Northern Illinois Huskies came back form 19 points down to win 30-29. The loss does not mean the 2018 season was not a success for UB. The Bulls will find out later this weekend who and where they will be playing their next game as they are certain to be invited to a Bowl Game. Perhaps they will be right back in Detroit playing in the Quick Lane Bowl on December 26th. A win in the Bowl game will give the Bulls an 11 win season, certainly something to be proud of. UB has come a long way since Lance Leipold took over the reins of the program four years ago. In that time, the Bulls have gone from a five win program to the 10 wins they had this year. Looking at the roster, the program has now been built up to where there should be repeated success. UB is going to lose four key players and five starters, two of whom will be certain NFL draft selections. Wide receiver Anthony Johnson could be a premium round selection while linebacker Khalil Hodge will more than likely be a Day-3 pick. Defensive end Charles Harris and center James O’Hagan could be late round picks or priority free agents depending on how pre-draft testing goes. The key question is if junior quarterback Tyree Jackson will return. Going into the 2018 season I felt that he had a chance to become a premium round pick if he improved on his play from 2017. That didn’t happen as Tyree had a bit of an erratic season. There is no question that he is very talented, but right now the book on him is that he isn’t a consistently good decision maker and he is more of a thrower than a passer. With a 57% completion percentage on the year he has to throw with more accuracy. Jackson would be better served returning for his final year and developing his skills. Another year with 13 or 14 starts will help him much more than sitting on a bench or practice squad in the NFL as far as game development. Regardless if Jackson returns or not, UB will have around 16 starters returning for 2019. That includes four players along the offensive line and three on the defensive line. Anytime a mid-major team has that many starters return, especially along the lines, good things happen. If Jackson also comes back the Bulls should be favorites to win the MAC East again in 2019. Even without Jackson, UB will be among the better teams in the MAC. In recent years, UB has done a good job recruiting and gotten the type of players who can come in and compete at the MAC level and play well. If this team can consistently have three of four NFL prospects a year in each class, they will do well. The early signing period for football begins in just under three weeks and UB hopes the success of this season brings in more quality players. Yes, losing the MAC Championship game was a disappointment, but looking ahead, this team is built to be in position to compete for more Championship games and that is what building a program is all about.